If a product tells me it'll help hide my wrinkles and make me look younger, who am I not to try it? It's like they know I have a newborn and am a little sleep deprived on occasion, or something. You guys are aware by now how much I love trying out face creams and beauty products. But this one... this one is a winner that's going to stay in my nightly routine for months to come. 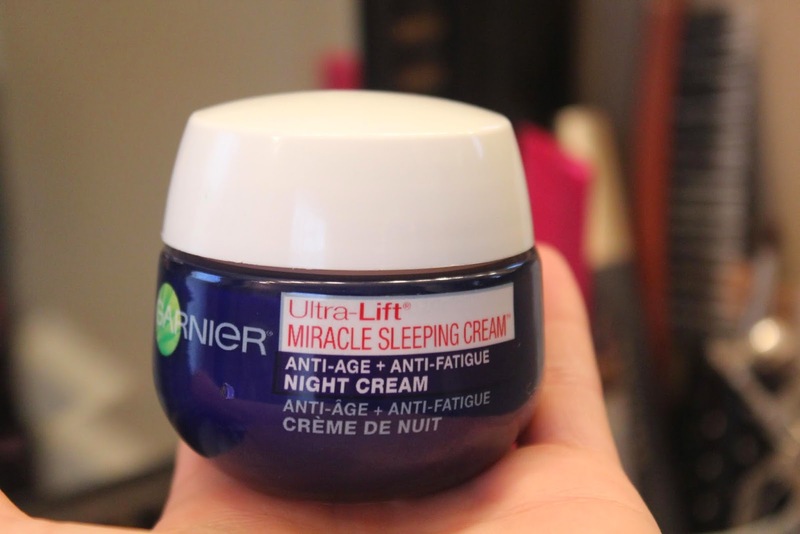 Garnier's Ultra-Lift® Miracle Sleeping Cream™ Anti-Age + Anti-Fatigue Night Cream is by far the best out there. I wanted something that was light for the spring/summer and that made me look more awake and fresh in the morning. I've been using it after I wash my face at night before bed and love it for a couple of reasons. First, the smell. It's infused with lavender essential oil and rare plant extracts, which make it so calming. Second, it's hydrating enough to last throughout the night and it fights wrinkles and signs of fatigue while I sleep. I wake up and my skin isn't dry or tired looking... it actually feels really smooth and soft. In 4 weeks: Wrinkles are visibly reduced. 81% said skin felt firmer and looked revitalized. 88% said skin felt smoother. Another thing I like about it is that you get a lot for the price. It's inexpensive (I got it on sale at Target for around $15) and you only need to use a small pea sized amount every time. If you want an eye cream to go with the night cream, Garnier has one of those too that you get for $16.99. It depuffs bags and reduces dark circles! Lastly, Garnier has you covered with prizes that will make you look like you didn't miss a wink! Enter the Sleep With This Sweepstakes now for the chance to win Garnier's Ultra-Lift® Miracle Sleeping Cream, a Westin Heavenly® Bed and more. Plus receive a $1 coupon* to try Garnier's Ultra-Lift® Miracle Sleeping Cream out for yourself. Enter daily for a chance to win a Miracle Sleeping Cream product prize package. Time for an awesome giveaway! Do you plan to try Garnier’s Ultra-Lift® Miracle Sleeping Cream™ Anti-Age + Anti-Fatigue Night Cream to help fight wrinkles and the signs of fatigue? Tell me in the comments for a chance to win a $100 VISA gift card. I will definitely be trying this product! I actually just read about this product in Allure and was so curious to try it so I ordered it on Amazon. If I like it I plan to buy it for my mom too. I love that it includes lavender. I've been looking for a good night cream. I will definitely be trying this product! I love Garnier products and would like to try this one. I used to use the Garnier eye cream and i think i developed a sensitvity or allergy to it. Or maybe they changed their formula... it was my favorite ever until it started making my eyelids break out in a rash the next day! :( I want to try this night cream, but I am a little afraid! I would LOVE this!! I need something to help with these fine lines I have noticed popping up! I definitely need to try this product!! I've been looking for a new night cream and will definitely try this one out!! Thanks for the recommendation! For sure! Anything to combat wrinkles! I'm willing to try anything that says it'll help these poor tired mommy eyes! I would love to give this product a try if I can find it at a store near me or online. Yes, I WILL be trying it. Sounds wonderful! I would love to try this night cream! I will be trying the Garnier’s Ultra-Lift Miracle Sleeping Cream Anti-Age + Anti-Fatigue Night Cream. I plan to pick some up this weekend, to try. It sounds like it will be a wonderful night cream. 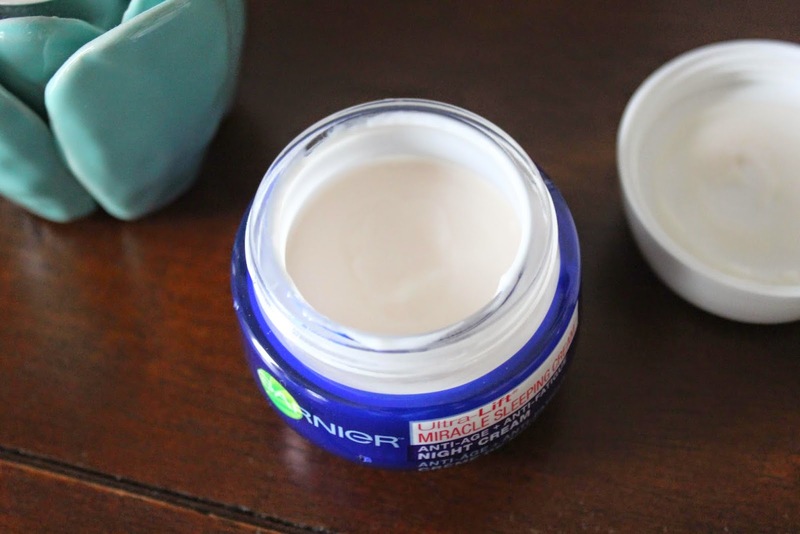 Yes, since I'm turning 40 this year I'd like to try Garnier’s Ultra-Lift® Miracle Sleeping Cream™ Anti-Age + Anti-Fatigue Night Cream to help fight wrinkles. I actually am using lancome right now, it's great, but much more expensive!! I would love to try this! I want my face to look the best it can be for my upcoming wedding! yes, i am excited to try it, i like this brand’s products. I think the Garnier’s Ultra-Lift® Miracle Sleeping Cream™ Anti-Age + Anti-Fatigue Night Cream is for me to help me fight wrinkles! And I am going to try this cream, and am excited to try it! I plan to try this product when I'm a bit older. I will use these products to try and get rid of the stubborn lines and bags under my eyes! would love to try this, never too early for prevention & the lavender sounds so calming! Yes, I would like to try this cream to see if it would make my skin look more youthful. I will probably try it. It sounds nice. I have not tried and didnnt plan to but im thinking it about I did!! If it does everything you are all saying, of course I will try it! I would need to check out the ingredients first. I have used Garnier products I bought in Europe, but that was a long time ago. Of course! It sounds like a miracle worker! I want to try this so bad! I'm going to pick some up next time I find it!! I need to try this. I turned 30 this year, and have just started using a night cream. I use and love Garnier products, they are great for my skin and affordable too. I would love to try this miracle cream for sure. I would love to try this night cream - I've been saying for awhile now I need to begin a quality anti-wrinkle regiment - Not sure what I am waiting for - maybe, I'm secretly hoping for "father time" to stop! I would definitely like to try this cream especially if it's getting good reviews and may be beneficial to my skin and make me look more rested and fresh. The cream sounds intriguing since it seems to make your skin look better in the morning and reduces wrinkles, so yes, I’ll try it! I definitely plan to try this! I looks amazing! totally would try this out - love the price too! I do need a change to help my aging skin. This product looks great, I will definitely be trying it! i love garnier products and am looking forward to trying this cream. I love Garnier products. I'd love to try this cream! i plan to give this product a try! Yes! I need something that works! Yes, I will try this product. It is something I really could use. I had not heard of this, but now at the age of 50 I would definitely like to try it. I do plan to try it. sounds great and will help with my current skin condition. thanks for the review. Yes, I will be trying this cream! I am going to try this and the eye cream. Yes, I will be trying this wonderful product to give my face a real lift. I am planning to try it. I need a good cream that will help with the wrinkles and the tired skin. I would love to try this cream sometime. 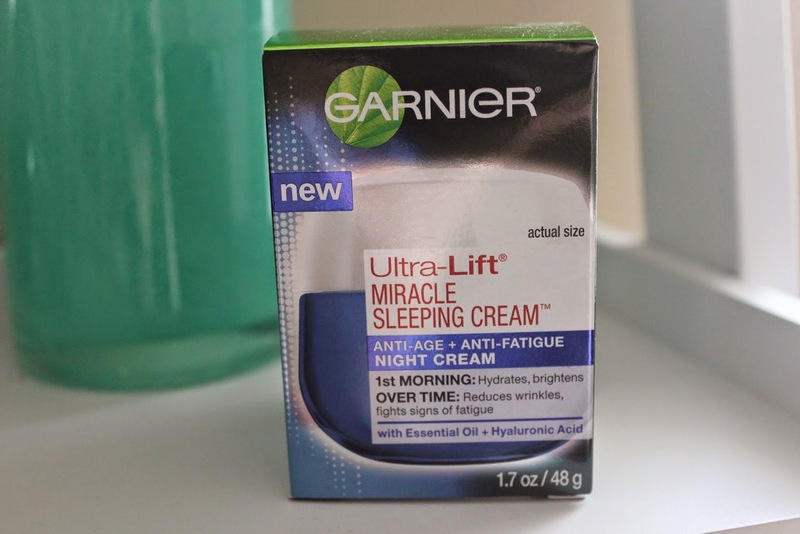 Oh yes I plan to try Garnier’s Ultra-Lift® Miracle Sleeping Cream™ Anti-Age + Anti-Fatigue Night Cream to help fight wrinkles and the signs of fatigue. I rarely am well-rested, so I need something to hide this fact from my face! I probably won't be buying this cream. I've earned all my wrinkles and I get 7-8 hours of sleep each night. Yes, I love trying new products that can help fight the signs of aging.